If you are chubby, Chinese, tattooed, pierced and in college, the People’s Liberation Army wants you. While the U.S. Marine Corps has tightened appearance standards in recent years — banning certain types of tattoos and cracking down on those who don’t make weight — the Chinese government is easing standards in hopes of drawing younger, better educated, urban youth. The Chinese military has lifted a ban on face and neck tattoos which have grown popular among fashionable youth, but they must be less than two centimeters across. Recruits can now also have ear piercings if holes are not obvious. And in an effort to widen the pool, recruits can now exceed weight standards by 25 percent, the Associated Press reports. As the world’s largest army with 2.3 million soldiers, the move is more about luring high-quality educated recruits than it is about quantity. A booming economy, modernization, and increasing levels of education mean more Chinese can pick and choose from higher paying careers that make the military less appealing than it once was. As a result, educational incentives are being used to draw university students. Those who agree to enlist will now receive the equivalent of $944 U.S. dollars in tuition assistance and their spots in school will be guaranteed when they return from serving, according to the AP. It isn’t exactly the G.I. 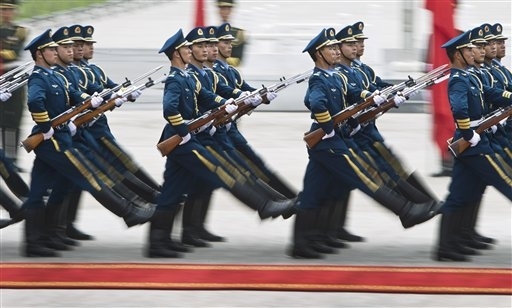 Bill, but military pay and benefits in China are improving as their defense budget continues to see double-digit annual percentage increases. Meanwhile, the U.S. Defense Department is reeling from recent budget cuts and slashing programs and benefits.